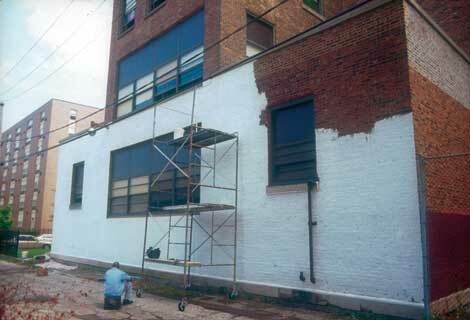 When starting a mural project a wall is often pre-selected by the sponsoring organization. 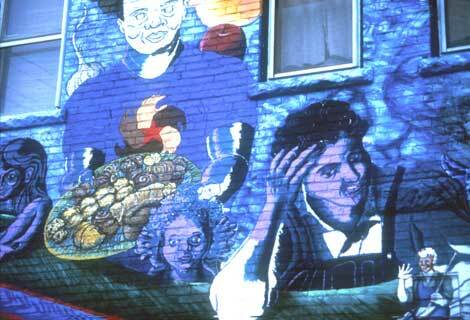 Ideally, the artist will be consulted to help select an appropriate site for a mural. Artists also sometimes search independently for a location to create a self-sponsored project. The artist conceives of an idea, identifies a wall, secures permission, and paints the mural as a gift to the surrounding community. Another process that can work well is for an artist to have an inspiration about a possible project for a place and then to involve community members and organizations in sponsoring the mural. You want a wall that is in good shape. If it is a masonry wall, this means that the brick and mortar is not crumbling, powdery, or too badly cracked or broken. It means that the wall does not have efflorescence—minerals that seep through the wall, leaving a build up of white salt-like stain. If the wall is only missing mortar in a few spots, tuckpointing can be handled by the artist or by a volunteer. A professional mason should tuck-point the wall if the job is extensive. This is for the benefit of the building and for the longevity of the mural. Before painting begins, a waiting period will be necessary after the completion of the tuck-pointing so that the mortar can cure. Consult your mason for the required waiting time. CPAG recommends waiting at least one week. The wall should not have any old layers of paint remaining, particularly if this paint is loosely attached. A thorough scrapping, wire brushing, and/or power washing will be necessary to clean the wall. If you powerwash, allow the wall to dry a couple of days before priming. A wall need not be perfect before a mural is applied. Minor cracks or uneven brick and concrete can be painted over. Standard procedures should include a washing of the wall to remove loose dirt and dust. This can be done with a large pail of water, brooms for scrubbing, and a mild detergent (dish soap). The wall should be rinsed clean and allowed to dry. A high-pressure water spraying system provides the most effective cleaning. Soda blasting of the wall is recommended when you are trying to remove old paint. This is different from sand blasting, which is far too abrasive and damaging to the brickwork. In some cases, a chemical stripping of the wall can be used. The long-term condition of any wall is dependent on the condition of the roof and stone caps on the parapet wall. It is to the benefit of the building and the mural that these be kept in good repair. Muralists can assist the longevity of murals by sealing the wall cap with the same sealer that they use to do the final sealing on the mural. Indoor walls may not require all of the procedures mentioned for outdoor walls. The paint should be tight to the wall and should be sanded or deglossed with a commercial product if the paint is shiny. Prime the wall with gesso or a good quality commercial primer before you begin the mural. Walls can also be covered with wood panels or with a canvas covering. This method has the advantage of allowing future people to preserve the mural if there is a need to repair the wall or if the building is torn down. Appropriate permission must be secured at an early stage to avoid disappointment. A signed permission agreement is ideal. You will need to communicate with the owner of the property and discuss the project proposal. 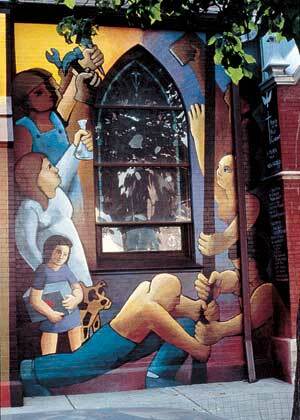 The objective here is to obtain some protection for the life of the mural. It is important to include the building owner in the development stages of your project. You will need to take accurate measurements of your wall early in the development of the plan. These numbers will help you when ordering the scaffolding and when you begin designing your art to the scale of the wall. A tape measure can be used with a friend helping on the other end. An early grasp of these measurements will add to your familiarity with your project. Be sure to accurately measure and place windows, doors, and other architectural features. 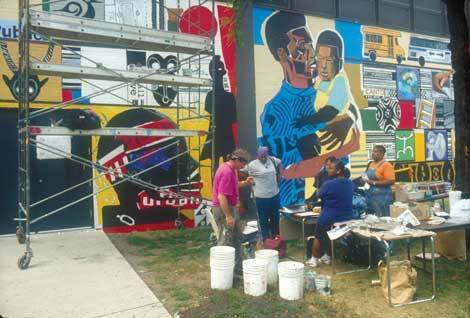 The central purpose in creating a community mural is to give a visual voice to a particular community. The design process should be seen as a collaborative activity that openly involves members of a community learning center, a neighborhood park, a local school, or a senior citizens facility. 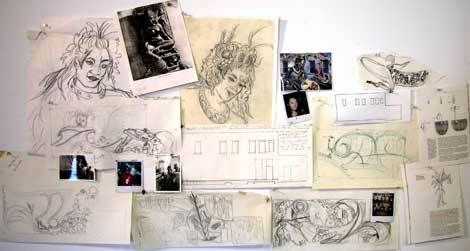 Several discussion meetings may be necessary as the artist or artist-team begins to develop the mural design. During these meetings, which may involve impromptu conversations with attendees before or after the event, you will begin to absorb the issues and matters of interest within the concerned body in attendance. The ideas raised at the meeting should be written on large sheets of paper for all to see. You may want to mount a lecture easel to hold an 18”x 24” pad of paper. Many large sheets of paper can also be pinned to the wall before the meeting and the artist team can fill these with notes during the public discussion. The design development is an interactive process. This should begin weeks, even months before any painting is done. You will want to include all important and concerned individuals: community representatives, sponsors, youth team members, and assisting artists in this stage. The process will likely involve several meetings that allow individuals to contribute ideas and issues of concern. It seems appropriate to do several meetings especially if a large number of people are involved. One of your meetings may include community representatives and sponsors. Another meeting might be held for community youth. A final meeting may be held where all parties are brought together to discuss the design. The objective here is to closely listen to those in attendance concerning the mural themes and to develop your drawings and research around the expressed issues. After meeting with the community group, you may find that some further research is necessary. You may need to visit a local historical society or community historian to obtain historical photos that allow you to be very specific about details for your mural design. Community members may hold helpful and exciting images within family photo albums. Local business organizations, schools, and storeowners can be surprising providers of intriguing material that gives your mural a visual edge. You may want to take photographs of your own to create images of interpersonal situations or to document needed local subject matter. Enlist community members to find needed material as a kind of homework assignment. This will enhance the community ownership of the work. It is important to know exactly which members of the community will give final approval to your design. Try to specify this clearly at the beginning of the process. Usually there is a small group of two or three people who have the final word and will give the green light to paint your design. The group will include such people as the school principal, one of his or her assistants, the director of a community center, or the local Alderman. The material you have researched will become the visual reference necessary to start your drawing and compositional studies. The early drawing stage should involve loose gestural imagery that is not too concerned with intricate details. This stage might also be initiated with a cut and paste technique. Photocopies can be cut and juggled into exciting relationships. Even these early drawings should be created in proportion to the size of your actual mural area. Often to paint the upper areas of the wall requires scaffolding. CPAG does not recommend trying to paint while standing on high ladders or provisional scaffolding. It is recommended that you visit a scaffolding supplier and become very familiar with the equipment and services that are available. There are several scaffolding size formats that you can choose from and an on-site visit with a representative of a scaffolding company can be a very good initiation into this important aspect of mural making. Make a good assessment of the ground area in front of your wall. The scaffolding will need a flat surface to move around on. Often a wall is situated in front of grass, dirt, or some other soft and uneven surface. These areas will need to be covered with heavy sheets of plywood or heavy wooden planks to give your scaffold firm footing. Once you have chosen your scaffolding system, you must become familiar with its use and operation. 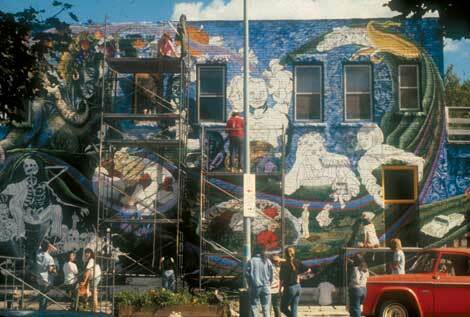 Generally, even veteran muralists experience a period of ‘getting oriented’ each time they begin a project. You will need to become comfortable with constructing, climbing, and working on the scaffold. Scaffolding management demands the utmost seriousness and safety concerns. Inexperienced team members should be slowly and thoroughly introduced to the operations of a scaffolding system. One should not work alone in the construction and dismantling of this equipment. The storage and safety of the scaffold equipment requires a mention here. In urban areas, this equipment is very much in demand and is readily stolen if left overnight or even unattended and unlocked during the day for brief periods. The materials can be secured in several ways: lock all the parts to a stationary point with large chains and locks, find a facility close by where you can store your materials each night (gas station, local residence, etc. ), or transport the materials in your vehicle each day. There are three main routes to getting your outline up on the wall. You may: 1) project your design using an overhead projector, 2) use a gridding system, or 3) directly draw your image onto the wall. Drawing can be done with large charcoal sticks or with a paint brush and thinned acrylic paint. Acrylic is recommended because it will dry and not fade or smear into the paint while you are working. Charcoal lines might be mistakenly wiped away or washed away by rain. Watery acrylic will drip down the wall, but these drips are easily covered when color is applied. Dark drips or mistaken lines may first need to be covered with white paint if they will be overpainted with light or transparent colors. Projecting outlines onto the wall is probably the fastest way to transfer the design. If you have a very complex design with lots of small detailed areas, the projector can eliminate the need for meticulous drawing and multiple corrections. To project a mural, reduce your line drawing to a transparency on a Xerox machine. Make sure the lines are still crisp and dark. Also, create a 1/2 inch line grid transparency to use to check that the image is being projected squarely onto the wall and is not distorted at an angle or elongated by height or width. Outdoor projecting involves some special conditions. Obviously, the projection must be done after dark. It helps to have dark plastic trash bags handy to mask unwanted streetlights. It can be fun to have a nighttime projection event. Typically, the mural team (and other invited artist volunteers) gathers before sunset to get everything set up and then works for several hours. A nice white wall is important here because a projection is less visible on a darkly tinted wall. Significant space is needed in front of your mural to allow projection. On a large wall, two scaffolding towers will be needed for the projection. One tower holds the art team tracing outlines on the wall, while the other tower holds the projector. The projector must be centered on the height and width of the projection area or the image will be distorted. On smaller walls, the projector may be situated on a large foldout ladder. Some walls may be too large for a complete projection to take place and gridding or free-hand drawing may become useful. This is the age-old technique for enlarging a design or drawing. Create a grid of squares on your small design and a corresponding grid of squares on the wall. The grid on the design can be drawn on an acetate overlay to avoid damaging your original drawing. After priming the wall, create a grid first using a chalkline and then painting the lines with a brush against a ruler. The squares on your small design might be one inch by one inch. This means that the squares on the wall might be one foot by one foot. By copying onto the wall what is in each square of your design, you begin to reconstruct your mural design at a large scale. You will want to render the basic outlines of your mural first and not involve yourself too much with modeling or details. Establish your overall layout as quickly as possible and begin to check for the correct proportion and “feel” of your major elements. It helps to draw with vine charcoal and a rag as an eraser and then to paint in the drawing as each section is completed and judged as accurate. The quantity of paint you need will be determined by the square footage of your mural. One gallon of paint or gesso is estimated to cover 100-300 square feet. Rough, textured walls absorb more paint. Complex painting techniques making use of underpaintings and the application of 2 or 3 layers of paint require larger quantities of paint. Figure how many times you are re-coating the wall and multiply to determine your paint needs. When selecting paints and colors, be careful to select colors that have good lightfastness ratings. Consult paint charts for the brand of paint you are using. Earth tones and black are most stable. Unfortunately, most blues and violets are somewhat fleeting and have a tendency to fade after five to ten years in direct outdoor sunlight. Nova Color Paint from Culverton, California is a highly recommended, relatively inexpensive paint suitable for murals. Liquitex paints are more expensive, but are highly saturated with pigment. Mural paints can be bought in pints and quarts. Nova Color sells colors in economical gallon sizes. Be sure to order a few gallons of gloss or semi-gloss acrylic medium to mix with paints to thin them and to create transparent glazes. Thinning acrylic paints with more than a few drops of water is not recommended as this will affect the longevity of your mural. The mural wall should be well primed before you begin drawing and painting on it. Be sure primer is applied to a well-prepared, well-cleaned wall. (See section above on wall preparation.) CPAG recommends priming with an acrylic gesso. Contemporary gesso products are made with acrylic polymers; they are more durable than latex-based primers. Gesso is also more heavily pigmented than latex primers and thus will give you a more opaque, sparkling white surface on which to begin your painting. If you dislike beginning on a white ground, you may tint your gesso with acrylic paint. Remember that a lightly applied coat of primer that leaves many small rough spots and “pinholes” will need to be re-done and will ultimately take more paint than a “juicily” applied single coat that adequately and completely covers the wall. It’s better to fill in pinholes with relatively cheap primer than with expensive, pigmented paints. Getting a crew of volunteers or youth assistants together to prime the wall can be a great way to begin a community mural project. You will need lots of rollers, pads, trays, and extension sticks. You can often secure a donation of these materials from a local hardware or paint store. Be sure that your roller pads are matched to the roughness of your wall. It helps to have “spotters” who use a brush to fill in particularly difficult areas and to trim around the edges of window and door frames. It is possible you may choose to spray your primer onto the wall instead of rolling it on. Spray equipment can be rented at equipment suppliers or a small hand gun can be purchased, often for less than $100. Spraying can be a quick way to cover your wall. You will need an appropriate sized machine for your wall. This is essentially the same sprayer used to paint houses. An air compressor is used to force paint through a hand-held spray gun. Generally some water is mixed with your gesso to make it flow smoothly through the spray gun. It is important not to dilute your gesso too much. A 5% water mixture is about all you need. Nova Color sells products that are designed to mix with sealer or gesso to increase the ease of spraying. Remember that if you are planning to spray the wall, you will need a convenient electrical hook up. Areas adjacent to your wall—sidewalks, doors, windows, trees, nearby automobiles, etc. will need to be masked to avoid damage from overspray. Pay attention to the ground underneath your wall. Drop cloths, plywood, or paper coverings should be used to protect this area when necessary. Indoors over tile floors, it helps to thickly wax the floor so the paint sticks to the wax and doesn’t stain the tile. Anticipate a big paint spill at some point during your project. Often spilled paint can be scooped up with pieces of cardboard and returned to the paint jar. (It’s worth doing this when you spill an expensive color such as Cadmium Red, especially if it’s your last jar.) Immediate removal of the paint and multiple rinses with water are necessary to prevent ugly blotches. Spills can be very difficult to remove from an uncovered concrete surface. It may not be necessary to cover the entire ground area at once. It may suffice to cover only the area you are working in at that time. Your finished mural will look much better with a clean sidewalk in front instead of a walkway splattered with an array of drips and smears. Some artists prefer to do layers of painting. This involves painting on a toned or colored ground. An undercoat is applied first using a color that contrasts or harmonizes with the layers of paint that will be applied on top. This top layer of color may be applied in such a way that aspects of the lower layer show through, creating a mixed-colored or vibrating affect. An impressionist effect can be achieved through a more complex layering process. On top of a darker base color, multiple harmonizing colors are applied with broken or hatching stokes of the brush. This can create a rather painterly affect where brush marks are very visible. A very active and moving surface is created. Coordinated colors are stroked and weaved together in this wet-on-dry paint technique. Realistic painting involves a good deal of color mixing, layering, and drybrushing techniques. Realism is created through the age-old process of modeling and rendering various shades of light and dark tones. It can be very helpful to pre-mix large quantities of color shades you will be using. Accurate drawing and excellent photographic reference material is crucial in order to obtain strong realism in your mural. Light tones, middle range tones, and shadow tones of colors are mixed wet-into-wet during this process. A layer of drybrushing with the same colors can be added afterwards in order to slightly adjust relationships of lights, shades, and shadowed aspects of your imagery. Further layers of drybrushing and mixing can add color accents where desired. The color possibilities are very important in mural making. You will want to think carefully about your color choices and research approaches used by other artists and painters. The theme of your mural will likely suggest some color directions to follow. A striking high contrast mural, By All Means Necessary, was created when artists Olivia Gude and Dorian Sylvain decided the composition would be painted solely in black and white. They wanted to create a high quality mural with much symbolic content in only 6 weeks so they decided to focus on drawing and design. In The Only Thing Keeping Me Down Is… Gravity, Kristal Pacheco and Veronica Werckmeister’s color conception revolves around two main colors of red and blue. This is a limited palette approach, where ranges of only a few colors create the entire composition. Accent colors, might be introduced throughout to create a kind of visual ‘pop’ inside the composition. A full color mural is always exciting, but these colors must be coordinated and harmonized. Color is often laid down without mixing in black or white. The color charts and studies of Johannes Itten may be helpful here. Itten discusses concepts such as color contrast, color harmony, and the spatial effects of color. There are numerous other sources such as color guides by designers that can be useful to consult when planning your mural. A visit to the art museum or library will most certainly introduce you to some dynamic color considerations. 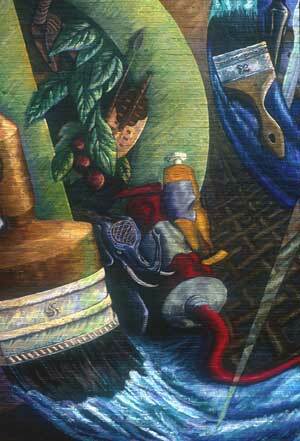 In many murals by John Weber, blacks and browns are heavily mixed with colors to create tonal color effects. In this style of working, blending and mixing are standard operating procedure for most every color applied. This is a more traditional use of color, similar to processes used by master painters such as Michelangelo, Caravaggio, and Diego Rivera. A volumetric, three- dimensional form is easily and quickly developed through tonal manipulations. Clean up at your site is important business. Try to keep your site in an orderly state. Many artists seem to think they have earned the right to be messy. Some seem to think this messiness is a sign of genius or creativity. Mostly, it is an indication of an inability or unwillingness to organize. If you have boxes and containers for your paints and brushes your clean-up should be relatively easy. Paint is less likely to get spilled if it is stored properly. Cardboard boxes or milk crates work well for storage and transportation of paints and materials. When traveling up and down the scaffolding, boxes allow you to move multiple containers of paint and brushes without too many trips back and forth. Be sure to have a method to cover up mixed paints—cans with lids, aluminum foil, or plastic wrap all work well. Remember that being too busy to cover a partially filled can of color can result in hundreds of dollars of wasted paint over the course of a project. Also, good brush cleaning is important to preserving your tools and staying within budget. Thoroughly wipe the brushes with newspaper, then wash well with soap and water (warm water if you have it on site), and then carefully shape and lay out your brushes for drying. You should keep a small supply of garbage bags in stock for trash such as empty, soiled, or wet paint cups, food particles and wrappers, rags, or weeds and dirt you have picked up around your wall. It is most important to leave a site in a better state than when you arrived. Neighborhood up-keep and cleanliness reinforces the effectiveness of your work in the community so begin modeling taking care of the site while the mural is in progress. 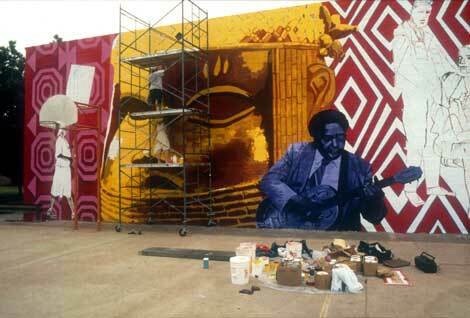 Your excitement will be high as you near the completion of your mural. You are completing an artistic statement that will stand in the community for ten to thirty years or more. You may want to study the work with a small group of advisers and decide if any important elements or ideas have been neglected. This review process may reveal that some material needs to be added, taken away, or simplified. As you finish, your excitement may be high, but as your energy may be getting low, it is a good idea if possible to take a break for a day or two and then come back with fresh enthusiasm to address necessary details. 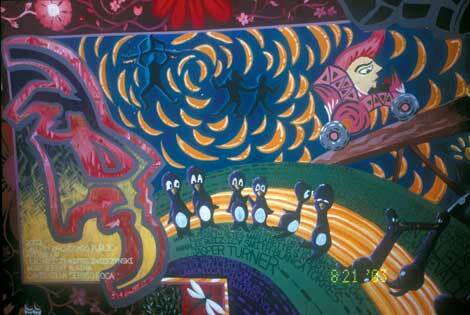 While looking at the mural with your fellow artists, make a list of every adjustment or correction that is needed. It can also be useful to consult photographs of the mural at this time to see if this different perspective suggests any adjustments in value or hue balance. You and your team should then move through the mural and correct line work, cover unwanted drips or stains, adjust color notes, or add another layer of paint to thin areas. Don’t be caught at the end of your project with no place for your credits. Here the artists skillfully blended the credits into the overall design. The time has come to sign your finished work. Be sure to check with all involved parties to collect names of contributors, sponsors, and appropriate supporters. All of your team members and assistants should also be listed. Allow several days for all of this information to trickle in. Careful attention in the development of this list will reduce the likelihood you will need to return to the wall later to add a forgotten name. The mural should be titled, dated, and a copyright logo added. Text can be hand lettered onto the wall. Sketch the letters onto the wall with charcoal first, paint in the letters, and when the paint is completely dry, wipe the wall clean. An alternative method is to design the text box on a computer and then to print this out onto a transparency. 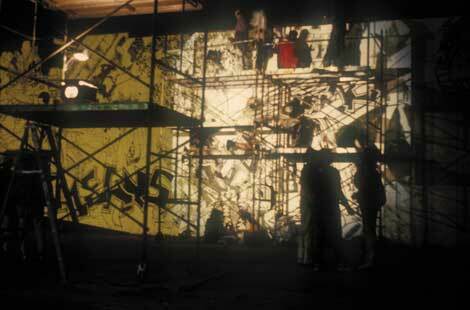 Using an overhead projector at night or under the shelter of a scaffold draped with a drop cloth, trace the projection onto the wall with paint. Generally a mural is coated with matt or semi-gloss acrylic varnish when it is complete. The quickest route is to spray the varnish with an airless sprayer. Varnish can also be rolled or brushed onto the wall. Avoid having to repair heartbreaking damage to your completed mural by doing a test-varnish on a small section of the wall. Rolling is the least preferred method; the one most likely to cause damage to your work. It is best to use at least two coats of varnish. The first coats should be done with a high gloss varnish to preserve the clarity of the colors. For the final coat, use a varnish of the desired degree of gloss. Be sure to test your varnish—sometime matte is very matte, sometimes it has the look of semi-gloss. You can intermix several varnishes of the same brand to achieve the desired glossiness. Polyurethane coatings are not recommended by CPAG. These coatings may yellow over time and they are not as flexible as acrylic, which allows moisture to escape from a wall without cracking of the paint layer. 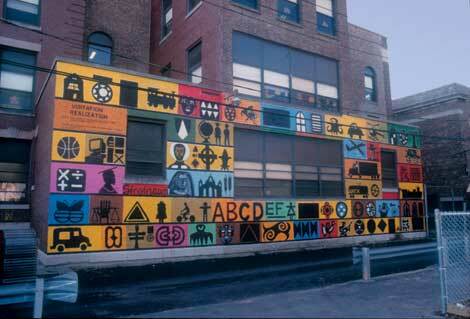 A mural can also be coated with graffiti protection. CPAG recommends Soluvar, produced by Liquitex. It is a varnish that can be purchased at many art stores. It is expensive, but as a graffiti protectant, it only needs to be applied to the lower areas of a mural. If you are planning to coat only the bottom of the mural, experiment with mixing matte and gloss Soluvar, until you achieve a mix that matches the gloss of your mural finish. It’s also a good idea to apply the Soluvar along the edges of forms in the mural and to feather it out so as to avoid a noticeable edge between the two types of sealer. Soluvar is an acrylic polymer designed to be solvent in mineral spirits. Use soft rags soaked with mineral spirits to remove the Soluvar and graffiti without damaging the underlying surface. After the graffiti is removed, the Soluvar should be reapplied. There are many advertised anti-graffiti coatings. Be suspicious of the various new claims of anti-graffiti companies. Often, these polyurethane-type coatings will ultimately cause yellowing and chipping—damaging your mural and the underlying wall. One method that may be worth trying is a sacrificial hot-wax treatment. Heated wax is applied to the wall after the painting and sealing of the work. In case of graffiti, the company returns to wash the wall with hot water, the graffiti is washed away with the wax, and then wax is reapplied to the wall. Such a coating could also effectively protect a mural from a build up of dirt over time. Check to see if this treatment is available in your area. 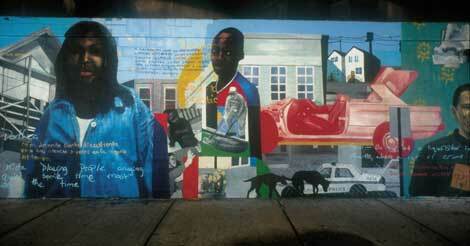 The completion of a mural can be a powerful offering to a community or neighborhood. In a recent work that I completed in Chicago, local residents stopped repeatedly to applaud the beauty of the work. Many viewers expressed appreciation for the messages relayed by the art. One passerby, a poet, was moved to offer up a poem in homage to the newly applied mural. 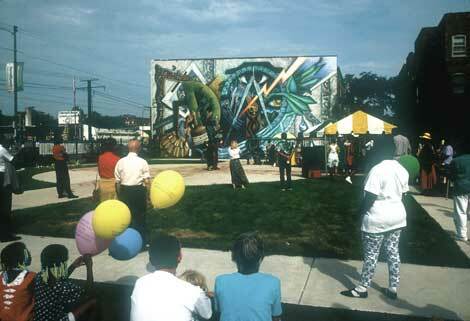 Murals have often been at the center of social, economic, and political changes in the areas where they are located--a powerful position, indeed. Young and older participants in a collaborative mural are often greatly affected by these experiences. Many are encouraged to pursue their own creativity more seriously. A tremendous sense of pride and accomplishment is attached to an elaborate, extended mural project. Even during modestly scaled mural projects, participants witness and help to realize the conception, development, and dramatic production of a long lasting work of art. 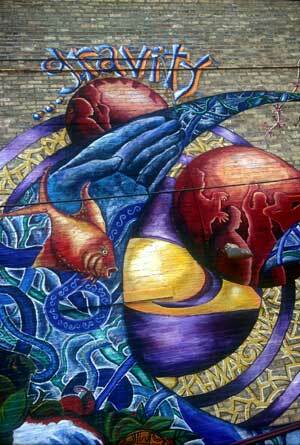 Many murals in Chicago have life spans of thirty years and more. With ongoing restoration and publication efforts, these works of art will speak to local, national, and international communities for decades to come. Much success to you in your future mural adventures.